BEFORE: I’m very lucky I got passes for today’s advanced screening of the new science fiction film, Looper. Normally a passes opens up a week or more prior to the screening but the passes were only released yesterday night, less than 24 hours before tonight’s show. So far there’s been a lot of positive buzz surrounding this film and I’ve been looking forward to seeing it. While the film seems exciting, I also see some potential for disappointment. Let’s see how this turns out. AFTER: Wow. This is going to be a thinker. A lot happens in Looper, there’s much that requires a lot of thought to understand, and there’s even more that doesn’t make sense. One thing is for sure though: Looper will enter the realm of science fiction greats because of its originality and creativeness. There are many great aspects about Looper but I think the best part is the approach the director, Rian Johnson, takes. This is a time-travel film. Time-travel is confusing and difficult to wrap your head around, even for genius astrophysicists. So how does Johnson avoid this problem. He basically tells you not to think about it. A conversation in the diner between Joe (Joseph Gordon-Levitt) and Old Joe (Bruce Willis) boils down to, “It would take hours and scores of diagrams to try and scratch the surface of time travel. So, we acknowledge there’s time travel, but lets focus on the story and the characters instead.” This by no means excuses plot holes or other problems with the film, I’ll get to that a bit later, but it adds a lot to your suspension of disbelief. Most of the story is full of spoilers and would be confusing to try and explain it to someone who hasn’t seen it. The trailer, and even the IMDb summary to some extent, does a fairly good job of setting up the premise; an assassin who kills people from the future faces a problem when his future self is his next assignment. What I will say is at various points throughout the film, you will think you know what is going on but really have no idea what is about to happen. On to acting, we have stellar performances from A to Z. Gordon-Levitt (last seen in Premium Rush) and Bruce Willis are great as usual, Jeff Daniels (last seen in Blood Work) continues to live up to my high expectations, but most surprisingly is the breakout performance by Pierce Gagnon as the young Cid. His performance is absolutely priceless and I’d go so far as to say he deserves a nomination for Best Supporting Actor. Gagnon has the skills of a professional adult actor and got reactions from the audience for even the smallest of facial expressions. It’s scary just how good this kid is. So there’s many positives to Looper but you’re probably wondering, what about those plot holes and problems I mentioned. Well I’m glad you asked. Due to the nature of time-travel, there’s bound to be inconsistencies. Acknowledging this is a step to remedy the problem, but as I said, it’s not an excuse. Multiple times I found myself thinking, “Well if he just does this, that solves ‘x’ problem,” or “How does this storyline make sense when you’ve already seen the alternate reality?” Sorry for the vagueness but there are so many little details that give away a lot of the film. In all seriousness though, there are some pivotal scenes that have big questions hanging over them. Part of it can be excused due to different interpretations and general ambiguity surrounding time travel, but there’s also a large part that just cannot be ignored. 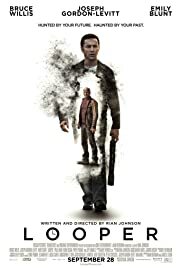 Except for the plot holes and some puzzling choices, Looper is quality entertainment. It’s part Inception, part The Terminator, and part Back to the Future in terms of mind-boggling, violence, and time-travel. If you’re going to the theater this weekend, the choice is easy: see Looper. Looper opens in theaters tomorrow, September 28.